I've been using Splunk at work, so I decided to try installing the free version on a personal laptop. Splunk is a log archiving and search product which I recommend security professionals try. Once you've used it you will probably think of other ways to leverage its power. Anyone can use a free version that indexes up to 500 MB per day, so it's perfect for a personal laptop's logs. This machine runs Ubuntu 8.04. By default Splunk installs into /opt. Unfortunately when I built this system, I didn't create a /opt partition, and / is too small. 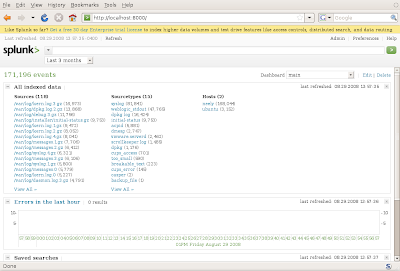 So, I decided to create a symlink in /var/opt and accept the rest of the defaults when installing Splunk. 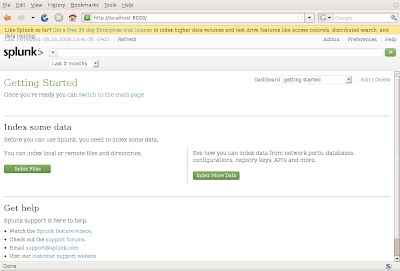 Next I installed the .deb that Splunk provides. 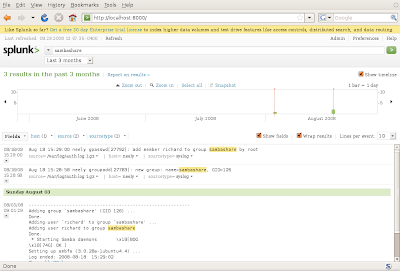 I've also used the .rpm on Red Hat Enterprise Linux. That was easy. Next I start Splunk. ditions of this Agreement will remain in full force and effect. If you get stuck, we're here to help. Feel free to email us at 'support@splunk.com'. Now I point Firefox to port 8000 on the local machine. Cool. 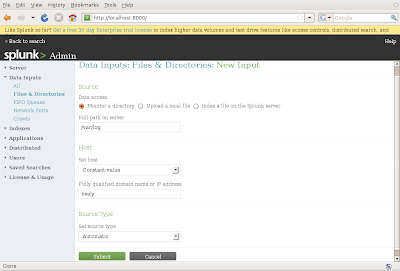 I need to tell Splunk to log something, so I select Index Files and point it to /var/log. Returning to the main screen, within seconds Splunk has indexed the measly 8 MB or so of logs I have in /var/log. Now I'm ready to start searching. For fun I start typing 'samba' in the search box, and decide to look at 'sambashare' as Splunk shows me what's been indexed. That's it. The big caveat here is that you need to protect the Web and administration ports (8000 and 8089 TCP) yourself -- the free Splunk doesn't even have authentication. There are several tutorials on the Web about that, mainly about firewalling those ports and then using a Web proxy or similar to access the ports locally. With regards to you using Splunk at work, did you/your co. compare it to any of the SIEM/SIM solutions out there? If so, can you highlight just a couple of the reasons you took this path? indexing files on a laptop? seems like slocate and grep work fine for that. why bother with opening a network listener for local searches? splunk is no siem. it competes with grep, spotlight, beagle, google desktop, etc. I'm glad Splunk isn't a SIM. If it were it would be worthless. Recognize that this is an older post, however I hound it 2 b very helpful. Thx Richard!